Customers browse at the Philadelphia Habitat for Humanity's ReStore in Point Breeze. Proceeds from the discount home improvement store, which has a large selection of new and used furniture, housewares and building supplies, is used to build and repair houses in Philadelphia. Toni Gibson, a graphic designer, was delighted to find an oak rolling file cabinet that cost $15 and two metal black lamps totaling $30, that would get a second life in her home office in University City. On a recent Saturday, she waited in the checkout line to purchase the furnishings at the nonprofit Habitat for Humanity ReStore on Washington Avenue in Point Breeze. “These are a steal,” said Gibson of her score, noting that had she bought the merchandise brand new, the price tags could’ve easily been double. Habitat for Humanity ReStore, 2318 Washington Ave., Philadelphia, is open Wednesday through Saturday, 9 a.m. to 5 p.m. Information: 215-739-9200. Everyone likes a bargain, but a bargain that helps others is even more a blessing. That’s the spirit behind the nearly 800 ReStore thrift outlets that sell donated furniture, building materials and appliances, and then use the profits to build and repair houses for need-based people. Frank Monaghan, executive director of Habitat for Humanity Philadelphia, said the outlet first opened in Kensington in 2012 and moved last June to its bigger and more visible location. The first U.S. ReStore opened in 1992. The Rittenhouse Hotel recently delivered armoires, dining tables, marble-topped sofa tables, and stainless-steel appliances from three floors of rooms and suites under renovation. Since June, the store has made $150,000 profit, with the proceeds being used to build 12 houses and repair another 90 homes by this July. At first glance, the expansive front room of the 16,800-square-foot store resembles a hip furniture showroom. On this day, the eclectic inventory consisted of a cherry dresser for $140 (about $500 new); a white wooden Crate & Barrel dining table with four gray chairs for $500 (about $1,100 new); a black wooden Ikea desk for $75 (about $150 new); and a taupe Crate & Barrel sectional for $1,500 (about $4,000 new). A few feet away from a chair from West Elm, however, there were some items you'd expect in a thrift store: an end table with a water stain, a chipped mirror, and a pastel paisley print. Scattered on the floors in the back two rooms, where 12 volunteers from Drexel University were stocking subway tiles and electronic parts, are sinks, appliances, toilets, air conditioners and rugs. A 42-inch-wide GE Monogram refrigerator had recently sold for $2,000 (about $7,000 new). 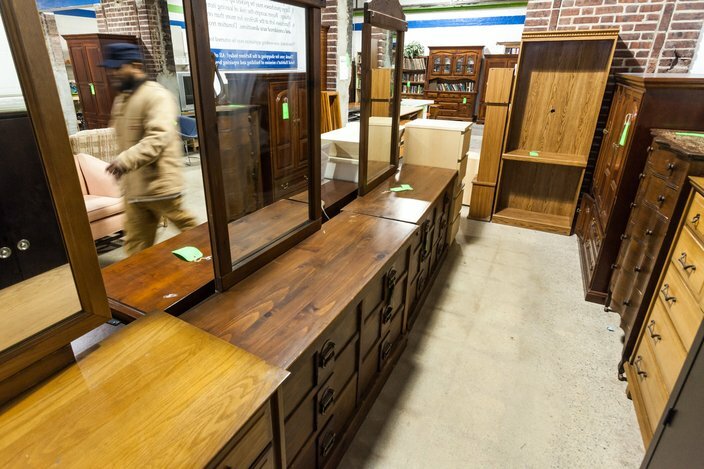 The most commonly sold items at the Philadelphia ReStore are dressers, couches and tables. The outlet has attracted arrivals in their 20s and 30s, who are settling in rowhomes in the surrounding neighborhoods. Other customers include grad students, small-time landlords, do-it-yourselfers, and environmentally concerned consumers. Art and antique collectors find treasures such as the 1865 buffet that came from a Chestnut Hill house and sold for $350. Vintage Knoll chairs that fetch around $600 on eBay were selling for $200. Occasionally, something offbeat gets dropped off. “Someone once brought in a Redbox vending machine,” says Monaghan. “We put it on our Facebook page and sold it for $10,000.” A fair share of pinball machines and shuffleboard tables are also donated. Store manager Greg Bradley said donations come from individuals, estates, schools, hotels and builders. Two weeks ago, the Rittenhouse Hotel delivered armoires, dining tables, marble-topped sofa tables, and stainless-steel appliances from three floors of rooms and suites under renovation. About the same time, the Murano, the bluish glass-and-steel condominium at 21st and Market, contributed $10,000 worth of new sectionals, chairs and coffee tables from five model apartments. ReStore has two trucks for pickups. Each item is cleaned and disinfected before it’s put on the floor. They do not accept mattresses or clothing. Donations are a tax deduction. And ReStore offers a two-week return policy, if a customer is unhappy with a purchase. Byron White, who remodels houses, was buying a can of metal primer for $5. He said he had looked at the custom kitchen cabinets, still sealed in boxes in the back of the store, but he didn't need them right now. A Flourtown, Montgomery County construction company had ordered the wrong size, about a $20,000 value. The cabinets were being sold for $50 to $75 a piece. 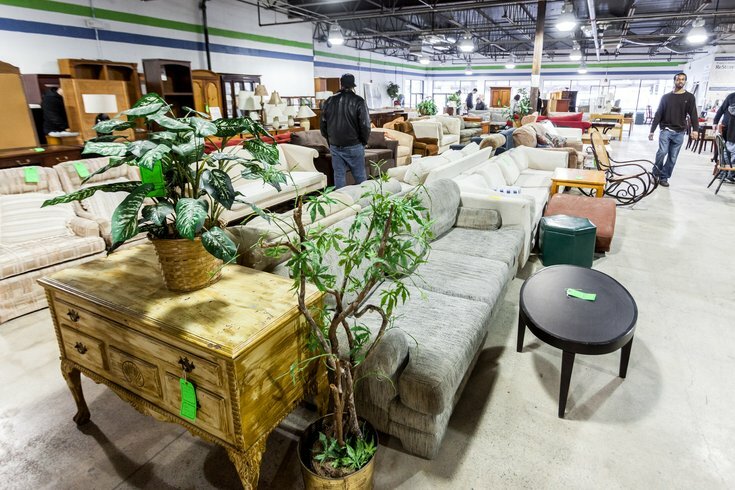 White, of University City, has a strategy for shopping at ReStore. “I make my list and then get here first thing in the morning, before everything is gone," he said.